U.S. Navy test pilots Cmdr. 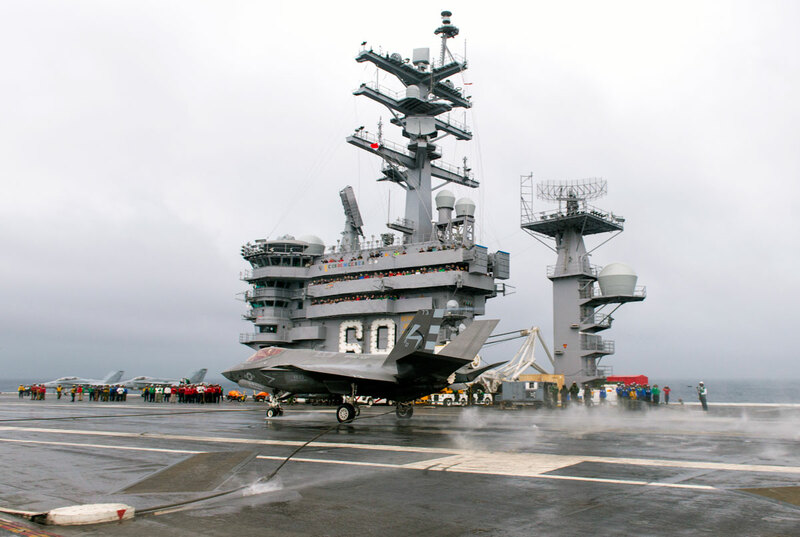 Tony Wilson and Lt. Chris Karapostoles landed F-35C test aircraft CF-03 and CF-05, respectively, aboard the USS Eisenhower (CVN-69) on 2 October 2015. The arrested landings are part of the two week at-sea Developmental Testing, or DT-II, phase for the F-35C. DT-II is the second of three at-sea test phases planned for the F-35C. Naval aircraft undergo at-sea testing to ensure new aircraft meet specifications and to identify mission critical issues sufficiently early in order to deliver fully capable aircraft in time for their scheduled Initial Operating Capability date. The two F-35Cs will be flown in a variety of operational maneuvers during DT-II, including catapult takeoffs and arrested landings, simulating maintenance operations, and conducting general maintenance and fit tests for the aircraft and support equipment.